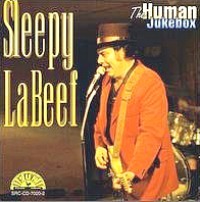 I might not have met Sleepy LaBeef had he not had a medical problem that required an operation to correct. When I saw his name on my patient appointment list, I thought the first name might have been misspelled. That was in the late-1980’s when I was a general surgeon in practice in El Dorado, Arkansas. During the initial consultation I discovered his name was spelled correctly, and it was a nickname given him as a child because he had a condition known as “lazy eye” causing his eyelids to droop making him to appear “sleepy” to his fellow students. I’m certain this was the source of lots of teasing, but because he was larger than most kids his age the teasing eventually stopped. Sleepy was born in Smackover, Arkansas in 1935, the youngest of 10 siblings and was raised on his family’s farm with kerosene lamps and a wood stove. They didn’t have electricity until he was 12. He learned to sing the Southern gospel style music in small country churches and constantly listened to the Grand Ole Opry and radio stations that broadcast rhythm and blues, bluegrass and country music. Sleepy sold his .22 hunting rifle to buy his first guitar and soon upgraded to a Sears & Roebuck model. His first quality guitar was a Gibson. He dropped out of school in the 8th grade and moved to Beaumont, Texas where he worked as a bellhop and began performing publicly in many different venues. During this period Elvis recorded his first 45 rpm record, “That’s Alright Mama”, and he played often in the Houston area. Sleepy moved to Houston and began playing with a number of top quality musicians such as Elvis, Glen Campbell, Roy Orbison and George Jones. He often played in opening acts for Elvis concerts in 1954 and 1955 when Elvis performed in the Houston area. Sleepy later moved to Nashville, Tennessee and along with his band recorded for Columbia Records and Sun Records. The musical style he developed has been called “rockabilly’ which is a cross between rock and roll and hillbilly. Sleepy refers to the music as American roots music. He has written and recorded a few original songs, but mostly has recorded songs of other writers. He has a phenomenal memory and is said to know the lyrics of well over 1000 songs. Sleepy’s records have not made the top of the charts in the United States, but in Europe he has been well-received and at least 2 of his songs; “Good Rockin’ Boogie,” and “Hello Josephine” have been chart toppers. Through the years he has given a number of young performers their first opportunity by allowing them to join his band. One of the musicians he helped who has achieved his own acclaim is Jason D. Williams from El Dorado, Arkansas. Jason D. joined Sleepy’s band when he was only 18 years old. He plays the piano in the musical style of Jerry Lee Lewis and in the opinion of many is more gifted musically than Jerry Lee. After a period of time, they separated to continue their own careers. Both Sleepy and Jason D. were inducted at the same time in the International Rock-a Billy Hall of Fame in Jackson, Tennessee in 2006. At the time of his surgical procedure in El Dorado, Sleepy and his wife Linda had not moved back to Arkansas, but soon moved to Springdale, Arkansas where they now live. Despite being in his 60’s in age at the time, he continued travelling and performing in the United States and overseas in Europe. He was drawing very large crowds overseas where his albums were also doing much better than in the states. When Cathy and I moved to Northwest Arkansas in 2000, I was not aware Sleepy and Linda were in Springdale, until one morning I saw his name on my appointment list at the Wound Care Clinic of Washington Regional Medical Center. Before I saw him, he had told our receptionist, “I am one of Dr. Moore’s former patients from El Dorado.” I was really thrilled to become reacquainted with Sleepy, and because he had a problem that required regular visits over several months to correct, we got to visit often. We talked about everything from faith to guitar playing to the difficult life of travel and playing concerts. I discovered Sleepy and Linda were deeply committed to the Lord Jesus and easily spoke about their faith. We prayed together during many of his clinic visits. Following resolution of his wound problem, I didn’t hear from them until one evening about a year later, I received a call from Linda saying Sleepy was an inpatient at Washington Regional Hospital. He had been admitted following a cardiac catheterization and was scheduled to have coronary bypass surgery the following day. He told his heart surgeon, “I’m not having any operation until my surgeon, Dr. Moore gives the ok.” The surgeon asked Linda if she would have Dr. Moore, whom he did not know, come to the hospital to talk with him about the operation. I immediately went to the hospital and found Sleepy in amazingly good spirits. He told me about his symptoms which had caused him to seek an evaluation, and the results of the cardiac cath. I simply told him in my opinion, he had no chance of improvement until he had the planned procedure. I also told him his surgeon had a good reputation and was skilled in his ability to do the procedure well. When I told him if I had his problem, I would go ahead with the operation, and in the final analysis God was in control of his life. He said, “That’s good enough for me. Linda tell the doctor to set the time for tomorrow.” We had prayer for his healing and both Sleepy and Linda told me they were at peace. I was in the waiting room the next day when the surgeon reported to Linda the operation was a success, and Sleepy would be home within a week. I was able to go to their home about 10 days later to remove his sutures.That was over 10 years ago and Sleepy is still singing and performing at age 80 years. Except for the lazy eye condition, the nickname “Sleepy” doesn’t fit him at all!